Understand everything that matters most to the U.S. economy as it pertains to America's largest ― and least understood ― generation. Discover what millennials want and what that means for the future of your organization. PEOPLE OFTEN ASK GALLUP, "Are millennials really that different?" The answer is yes ― profoundly so. Millennials will change the world decisively more than any other generation. As this report shows, millennials will continue to disrupt how the world communicates ― how we read and write and relate. Millennials are disrupting retail, hospitality, real estate and housing, transportation, entertainment and travel, and they will soon radically change higher education. Millennials are altering the very social fabric of America and the world. They're waiting longer to get married and have children, and they're less likely than other generations to identify with specific religions or political parties. Defined by their lack of attachment to institutions and traditions, millennials change jobs more often than other generations ― more than half say they're currently looking for a new job. Millennials are changing the very will of the world. So we, too, must change. Gallup is recommending that our client partners change their organizational cultures this year from old will to new will. There are six functional changes that we call the "Big Six." 1. Millennials don't just work for a paycheck ― they want a purpose. For millennials, work must have meaning. They want to work for organizations with a mission and purpose. Back in the old days, baby boomers like me didn't necessarily need meaning in our jobs. We just wanted a paycheck ― our mission and purpose were 100% our families and communities. For millennials, compensation is important and must be fair, but it's no longer the driver. The emphasis for this generation has switched from paycheck to purpose ― and so must your culture. 2. Millennials are not pursuing job satisfaction ― they are pursuing development. Most millennials don't care about the bells and whistles found in many workplaces today ― the pingpong tables, fancy latte machines and free food that companies offer to try to create job satisfaction. Giving out toys and entitlements is a leadership mistake, and worse, it's condescending. Purpose and development drive this generation. 3. Millennials don't want bosses ― they want coaches. The role of an old-style boss is command and control. Millennials care about having managers who can coach them, who value them as both people and employees, and who help them understand and build their strengths. 4. Millennials don't want annual reviews ― they want ongoing conversations. The way millennials communicate ― texting, tweeting, Skype, etc. ― is now real-time and continuous. This dramatically affects the workplace because millennials are accustomed to constant communication and feedback. Annual reviews no longer work. 5. Millennials don't want to fix their weaknesses ― they want to develop their strengths. Gallup has discovered that weaknesses never develop into strengths, while strengths develop infinitely. This is arguably the biggest discovery Gallup or any organization has ever made on the subject of human development in the workplace. Organizations shouldn't ignore weaknesses. Rather, they should minimize weaknesses and maximize strengths. We are recommending our client partners transition to strengths-based cultures, or they won't attract and keep their stars. 6. It's not just my job ― it's my life. One of Gallup's most important discoveries is that everyone in the world wants a good job. This is especially true for millennials. More so than ever in the history of corporate culture, employees are asking, "Does this organization value my strengths and my contribution? Does this organization give me the chance to do what I do best every day?" Because for millennials, a job is no longer just a job ― it's their life as well. IN THE U.S., ROUGHLY 73 MILLION MILLENNIALS were born between 1980 and 1996. Like those in every generation before them, millennials strive for a life well-lived. They want good jobs ― ones with 30-plus hours of work a week and regular paychecks from employers. They also want to be engaged in those jobs - emotionally and behaviorally connected to them. In addition to finding steady, engaging jobs, millennials want to have high levels of well-being, which means more than being physically fit. Yes, millennials want to be healthy, but they also want a purposeful life, active community and social ties, and financial stability. Regarding that financial stability, millennials want to be able to spend money not just on what they need, but also on what they want. However, Gallup has found that millennials struggle to find good jobs that engage them. Millennials have the highest rates of unemployment and underemployment in the U.S., and only 29% of employed millennials are engaged at work. Half of millennials say they feel good about the amount of money they have to spend, and less than 40% of millennials are what Gallup defines as "thriving" in any one aspect of well-being. Their overall well-being nearly matches that of Gen Xers and baby boomers, meaning that millennials have not been able to forge better paths for themselves than many Americans have before them. While it is every parent's dream to have their children lead a better life than their own, not all millennials are positioned for such success. Why does any of this matter? Because the strength of the marketplace and workplace depend on what the millennial generation can accomplish. If millennials cannot find good jobs, the economy will continue to lag. If they are not engaged in those jobs, companies' profitability, productivity and innovation will suffer. And if they are not thriving in their well-being, they will struggle in life, affecting how they perform as citizens, consumers and employees. In nearly every corner of the U.S., business executives, community and civic leaders, marketers and managers are talking about millennials and their behaviors, attitudes and beliefs. They want to understand how this generation is similar to and how they differ from their predecessors, as well as how to apply this knowledge to create more engaged employees and consumers and healthier, happier citizens. Gallup has taken on a significant and wide-reaching research effort aimed at helping institutions, businesses and employers understand the millennial generation. Gallup gathered the data in this report from a variety of sources, including the Gallup Panel, Gallup Daily tracker, Gallup-Healthways Well-Being Index, and Gallup's employee and customer engagement databases. Through this extensive research effort, Gallup analyzed and uncovered the most important findings related to millennials, including how they present themselves as people, consumers and employees. From millennials' demographic makeup to their spending habits to their ideal employers, this report addresses everything that matters most to the U.S. economy as it pertains to America's largest ― and least understood ― generation. ONLY 29% OF MILLENNIALS ARE engaged, meaning they are emotionally and behaviorally connected to their job and company. Another 16% of millennials are actively disengaged, meaning they are more or less out to do damage to their company. 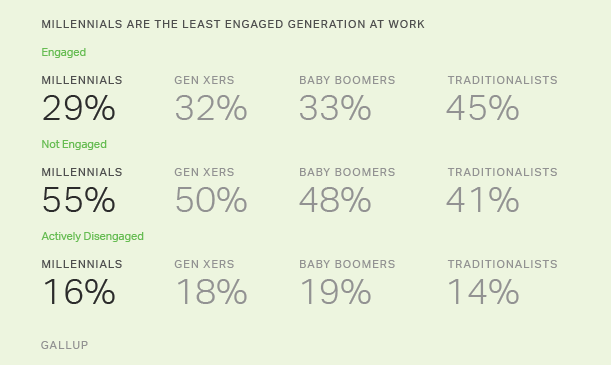 The majority of millennials (55%) are not engaged, leading all other generations in this category of workers. Not engaging millennial workers is a big miss for organizations. The millennial workforce is predominantly "checked out"― not putting energy or passion into their jobs. They are indifferent about work and show up just to put in their hours. Often, millennials are characterized as entitled job-hoppers, but the reality is that 55% of this group is not engaged at work. They feel indifferent about their job and company ― and indifferent and entitled are not synonymous. Many millennials likely don't want to switch jobs, but their companies are not giving them compelling reasons to stay. When they see what appears to be a better opportunity, they have every incentive to take it. While millennials can come across as wanting more and more, the reality is that they just want a job that feels worthwhile ― and they will keep looking until they find it. GALLUP DATA REVEAL THAT 21% of millennials report changing jobs within the last year, which is more than three times the number of non-millennials who report the same. 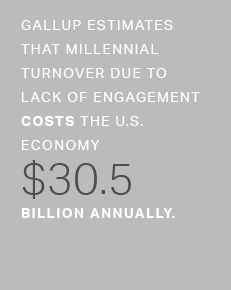 Gallup estimates that millennial turnover costs the U.S. economy $30.5 billion annually. Millennials also show less willingness to stay in their current jobs. Half of millennials ― compared with 60% of non-millennials ― strongly agree that they plan to be working at their company one year from now. For businesses, this suggests that half of their millennial workforce doesn't see a future with them. Since many millennials don't plan on staying in their jobs, it makes sense that they are hunting for new positions. A Gallup study found that 60% of millennials say they are open to a different job opportunity; this is 15 percentage points higher than the percentage of non-millennial workers who say the same. Millennials are also the most willing to act on better opportunities: 36% report that they will look for a job with a different organization in the next 12 months if the job market improves, compared with 21% of non-millennials who say the same. THE RELATIONSHIP BETWEEN MANAGER AND EMPLOYEE represents a vital link in performance management. As is often the case, communication is crucial for that relationship to succeed. Millennial workers are more engaged than non-millennials when their managers provide frequent and consistent communication and feedback. Forty-four percent of millennials who report that their manager holds regular meetings with them are engaged ― contrasting sharply with the 20% of engaged millennials who do not agree that their manager meets with them regularly. This finding is similar to older generations; 43% of non-millennials who report their manager holds regular meetings with them are engaged. Regular meetings and consistent feedback pay dividends not only in engagement, but also in performance. Employees who meet regularly with their manager perform better for their team and company. They are also more likely to report that they regularly receive recognition and praise, that someone cares about them as a person and that someone cares about their development. Effective feedback is rooted in a few essential tenets; chief among them is frequency. The more conversations managers have with their employees, the more engaged their employees become. But Gallup found that only 21% of millennials and 18% of non-millennials meet with their manager on a weekly basis. The majority of employees ― 56% for millennials and 53% for non-millennials ― say they meet with their manager as infrequently as less than monthly. MILLENNIALS ARE FIRST-GENERATION DIGITAL NATIVES who feel at home on the Internet. Technology ― particularly gadgets like smartphones, but also tablets and laptops ― has revolutionized the way they connect and interact with one another and with the rest of the world. While the vast majority of Americans surf the Web from a desktop or laptop computer at home or work, 85% of millennials access the Internet from their phones ― more than all other generations. What are millennials doing online? Millennials, like Gen Xers, get the vast majority of their information and news from the Internet. They are far less likely to watch conventional television to stay up to date. 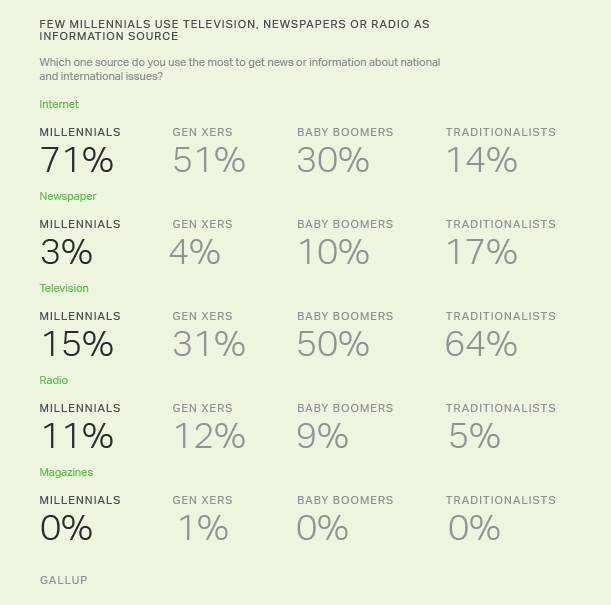 On the other hand, more than half of baby boomers and traditionalists get their news and information from TV, and just 30% of baby boomers and 14% of traditionalists find it online. But millennials rely on the Internet for far more than news and information. For instance, at least eight in 10 report using it to manage their finances, pay bills, shop online, and watch or listen to online content in the past 30 days. At least half use it for reading blogs, researching health issues, or researching or booking travel plans. Smaller percentages use it for taking classes, participating in online auctions and other activities. While Gen Xers come close to the percentage of millennials using the Internet for each of these activities, in most cases, baby boomers and traditionalists lag behind. Of course, millennials also rely on the Internet and smartphones or other devices to manage their social lives online. In this way, they are no different from older generations. The vast majority of all Americans say they use social media to connect with friends and family, including 93% of millennials and 84% of older generations. A MAJORITY OF MILLENNIALS (55%) SAY that religion is important to them, but this falls far below the 65% of Gen Xers, 70% of baby boomers and 76% of traditionalists who say the same. 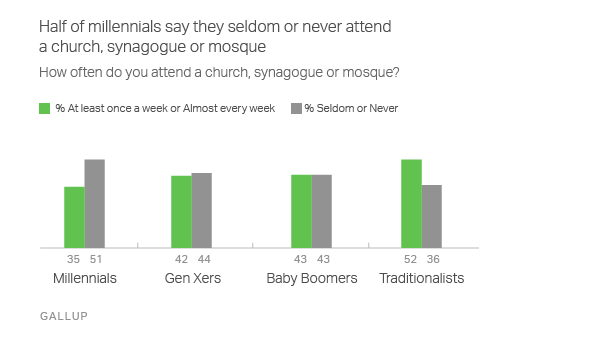 Half of millennials say they seldom (24%) or never (27%) attend a church, synagogue or mosque, compared with 27% who say they go at least once a week. The percentage of Americans who are eschewing religious affiliation also appears to be on the rise, with millennials leading this trend. In 2008, 23% of this generation said they had no religious preference. By 2015, this number climbed 7 points. The older generations also saw a modest bump in those claiming no religious preference, but no more than 1 to 2 points each. In general, Gallup finds that Americans tend to grow more religious as they age. However, the traditional Christian denominations that once dominated American culture appear to be declining, with many younger U.S. adults turning instead to the amorphous "other Christian religion" category or shedding their religious identity altogether. THE ENTIRE POPULATION OF MILLENNIALS has now reached voting age in the U.S., affording this generation the potential to wield tremendous political power, given its size. For an example, look no further than President Barack Obama's historic election victory in 2008 and his re-election in 2012, when the youth vote was instrumental in putting him ― and keeping him ― in office. However, it would be a mistake to think all millennials align with the Democratic Party. 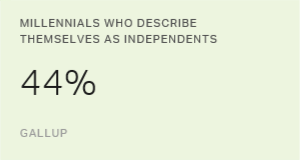 Instead, Gallup finds that the plurality of millennials (44%) describe themselves as independents. Only 28% identify as Democrats, and 19% identify as Republicans. 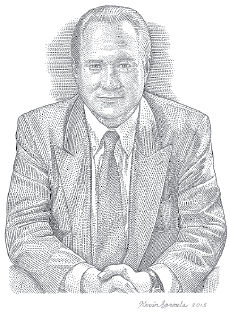 The appeal of the major political parties is largely waning among this generation. However, millennials who do not identify as either Democrat or Republican are somewhat more likely to say they lean toward the Democratic Party than the Republican Party (33% vs. 26%, respectively). More millennials also classify their political views as moderate than they do liberal or conservative, putting millennials' political inclinations solidly in neutral territory. 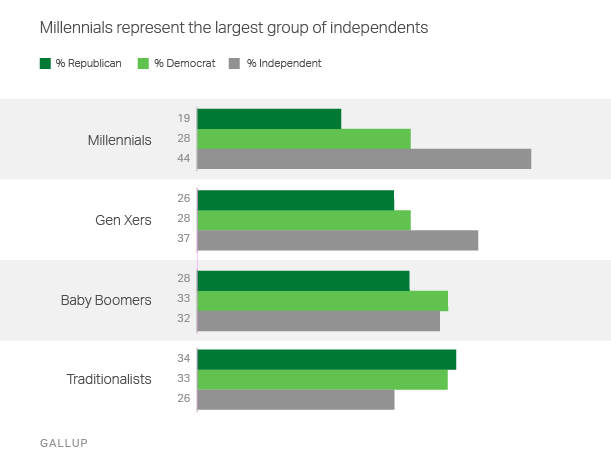 Compared with their older cohorts, millennials represent the largest group of independents and the smallest group of Republicans. Their participation in the Democratic Party is on par with that of Gen Xers. Millennials also claim the highest numbers of moderates and liberals, as well as the lowest numbers of conservatives, among all generations. ONLY ONE IN FOUR MILLENNIALS are fully engaged ― meaning they are emotionally and psychologically attached to a brand, product or company. Their engagement trails that of older generations. Millennials also have low levels of customer engagement across most industries that Gallup tracks. In the banking industry, for example, 31% of millennial customers are fully engaged. In the hospitality industry, 20% of millennial customers are fully engaged. What is more discouraging is that millennial customers are also much more likely to be actively disengaged than any other generation of consumers. In some industries, their level of active disengagement is nearly on par with ― or exceeding ― their level of engagement. In the insurance industry, 31% of millennial customers are fully engaged and 27% are actively disengaged. In the airline industry, just 12% of millennials are fully engaged, while almost four times as many (46%) are actively disengaged. AMONG AMERICANS OVERALL, SPENDING HAS declined since 2008 ― the first full year of the Great Recession. Currently, millennials spend an average of $85 per day and account for 28% of all daily per-person consumer spending in the U.S. ― a number that is expected to climb as high as 35% over the next 15 years. Millennials' spending mirrors that of baby boomers, is below that of Gen Xers and is greater than that of traditionalists. The U.S. economy has been recovering at a slow pace over the past eight years, with young adults' spending hit hardest by this lethargic state. In 2008, Americans ages 19 to 35 were spending an average of $98 per day. 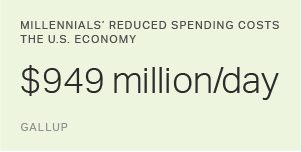 Among that same age group now, spending has fallen by $13. Among older Americans, spending is close to ― if not on par with ― 2008 levels. Perhaps because of their lower wages and higher amounts of student debt, millennials are unable to catch up to pre-2008 spending levels, while older generations are less likely to have those constraints. 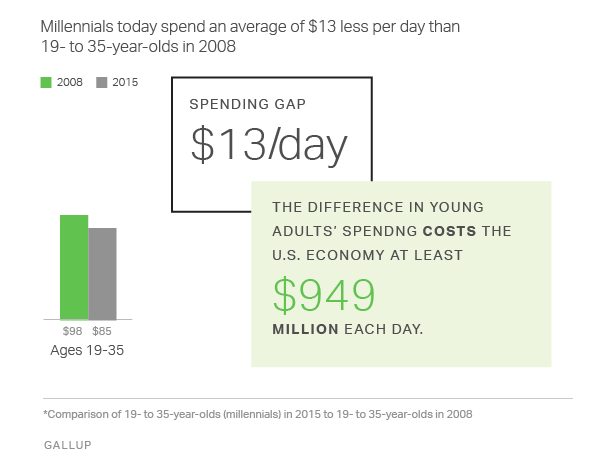 In any case, Gallup estimates that the difference in young adults' spending from 2008 to 2015 costs the U.S. economy at least $949 million each day. AMERICANS HAVE USED A VARIETY of methods to deal with saving or spending money. 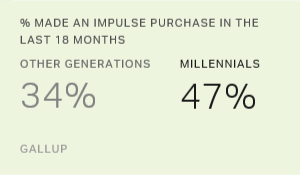 With a few exceptions, Gallup discovered that across six different polling periods, millennials were more likely to have engaged in most of the spending and saving behaviors asked about than members of the other generations. These methods present something of a paradox, however, because some of the behaviors are less thrifty than others. On the thrifty side of the ledger, around seven in 10 millennials have gone online to compare prices (71%), compared with more than half of other generations (55%). Over the past year, the percentage of millennials comparing prices and deals online has increased considerably, but the percentage of older generations doing so has remained largely unchanged. This finding is not particularly surprising, given millennials' familiarity with and use of technology. Millennials are also much more likely to have purchased used goods than members of the other generations. Millennials and older generations are equally likely (84%) to have purchased generic or store brand goods. But while the percentage of millennials purchasing generic or store brand goods has increased over the past year, it has declined by 3% among the older generations. Finally, older generations have used coupons while shopping more often than millennials have (60% vs. 55%) ― the only item to show that pattern. Coupon use has declined among all generations over the past year. Millennials are more likely to engage in a number of less thrifty behaviors, suggesting that they may be a little more free-wheeling with their spending than members of other generations. They are much more apt to have gone shopping for fun, to have made an impulse purchase and to have made a major purchase that cost at least one week's pay than members of the other generations. 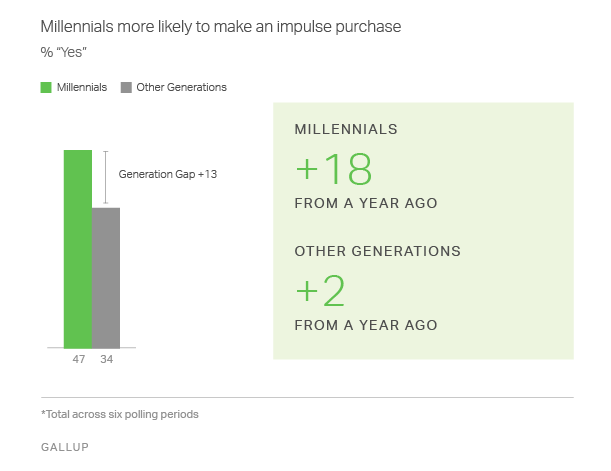 Impulse purchases and big-ticket purchases have notably increased among millennials ― but not the other generations ― over the past year. Discover how your organization can attract, retain and engage millennials. Bring our How Millennials Want to Work and Live Workshop to your organization. Gallup has taken on the significant and wide-ranging research effort How Millennials Want to Work and Live to help institutions, businesses and employers understand this powerful generation. Featuring unprecedented analysis of decades of research, How Millennials Want to Work and Live uncovers the most important findings related to millennials, including how they present themselves as people, consumers and employees. What do millennials want from their workplace? What can organizations do to attract, engage and retain millennial employees? What are millennials doing online? How do millennials identify politically? Religiously? How do millennials spend and save their money? How do brands miss the mark with their millennial consumers? What effects do the ways millennials work and live have on the U.S. economy? 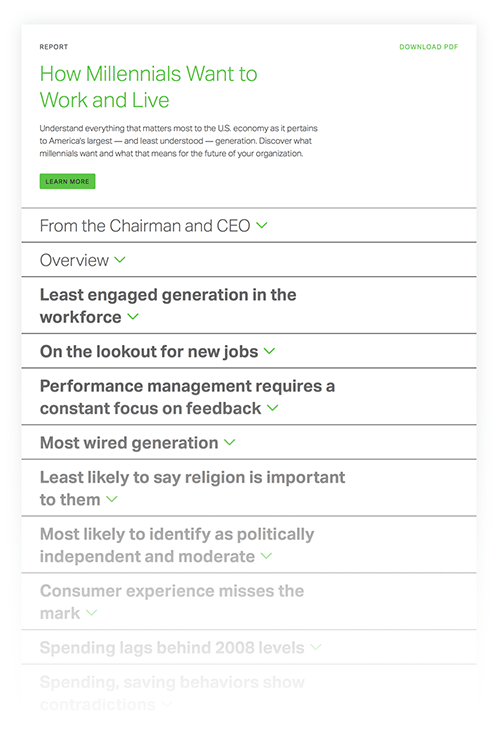 This interactive version of the report highlights Gallup's most important findings about millennials, including their demographic makeup, spending habits and desires for the workplace. Complete the form to get the complimentary How Millennials Want to Work and Live report. Please complete the form below to receive an email with a link to download this report.